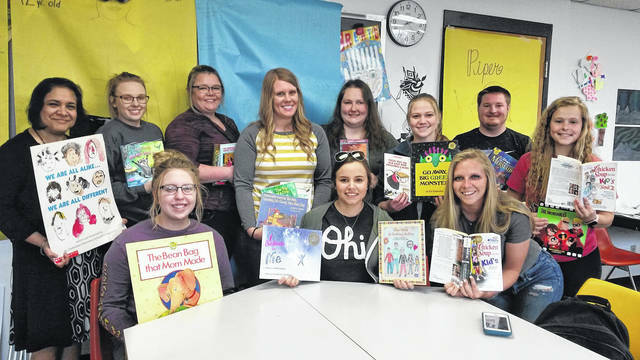 Students in the University of Rio Grande and Rio Grande Community College Bunce School of Education collected 1247 donated books to send to area elementary schools. RIO GRANDE – Students in the University of Rio Grande’s Bunce School of Education are working to make a difference in southeast Ohio. As part of this effort to support the community, Dr. Sangeeta Gulati’s Multicultural Relations class recently hosted a book drive to collect books for local elementary schools’ libraries. She said the students put a lot of time into making the project a success. The students in Gulati’s class set up drop-off boxes throughout campus as well as businesses in Rio to collect books for Pre-K through sixth grade reading levels. Leigh Davis, a post-grad student from South Bloomingville earning her music education licensure, said she first noticed the need for new books while visiting a local elementary school. After the book drive, the class tallied the books and sorted them by grade levels. Gulati said the idea behind the class is to give her students a better idea of different concerns around the world, and teach them to create global awareness once they become teachers. The students collected 1247 books to divide between the five elementary schools. Gulati said the community played a large role in reaching this total and that the class even received a donation from Bossard Library in Gallipolis. Corey Farley, a junior early childhood education major from Jackson, said the class wanted to find a way to make the project about education in the community.